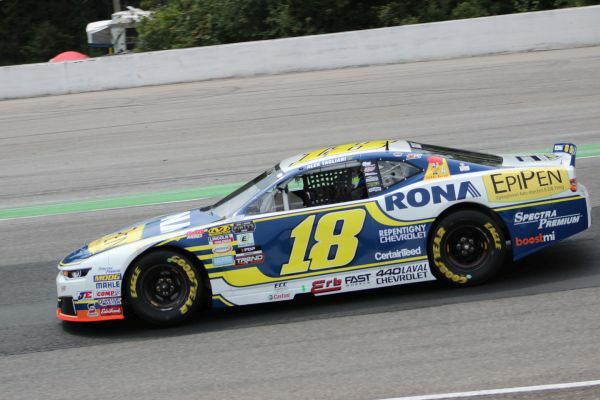 Alex Tagliani recently mentioned that the Canadian Tire Motorsport Park (CTMP) road course owed him a couple of wins after suffering mechanical glitches or just plain bad luck over the years. Well on Sunday, the Canadian driver got one back by winning Round 10 of 13 of the 2018 NASCAR Pinty's Series held at the 3.957 km challenging track. Starting third, he drove his number 18 EpiPen/RONA/St Hubert Chevrolet Camaro to first place on lap 30 of the 51-lap TOTAL Quartz 200 and dominated the rest of the race, never looking back and crossing the finish line 1.456 seconds ahead of Kevin Lacroix who had started in 15th position. 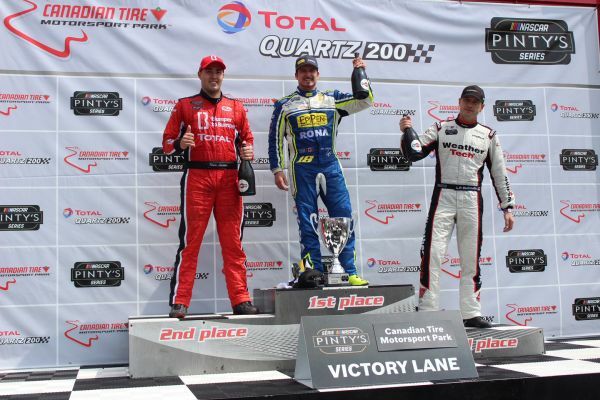 In his previous seven races at CTMP, Tagliani recorded a best finish of second place last year. "This win is a tribute to the hard work done by the 22 Racing organization," said Alex Tagliani. "I guess that after finally paying our dues at this track, we got this well-deserved win for all the boys on the team. In the first round of the 2018 season here at CTMP, we were leading the race with three laps to go and suffered a mechanical failure. I saw the sad looks in their eyes. They really wanted that win then, but we got it today. Our pit stops were great today and they got us in good position for each restart. It was not an easy race to win but we were always in contention. I am very happy with the final outcome. It now puts pressure on LP Dumoulin in the championship race. Hopefully the last three rounds of the schedule will be good to us because the competition is very intense." Point's leader LP Dumoulin finished third ahead of his brother Jean-François. Anthony Simone rounded up the top 5. This was Tagliani's seventh top-five finish in 10 starts this year. Twenty-six drivers started the race with 23 crossing the finish line. Eighteen cars finished on the lead lap. The race was under full course caution three times for a total of 18 laps. The TOTAL Quartz 200 will air on TSN2 on Saturday, September 1 at 1:30 p.m. ET. With win number two of the season, Tagliani moves to second place in the driver's championship race with 404 points. He reduces the gap to leader LP Dumoulin to only 14 points. In 10 Pinty's starts this season, Tagliani has six podium finishes including a pair of wins, for a total of eight top-10 finishes. He also scored a pole position in Toronto to up his Pinty's career total to nine. In 68 NASCAR Pinty's Series career starts, Tagliani has eight wins, 29 top-fives and 46 top-ten finishes. 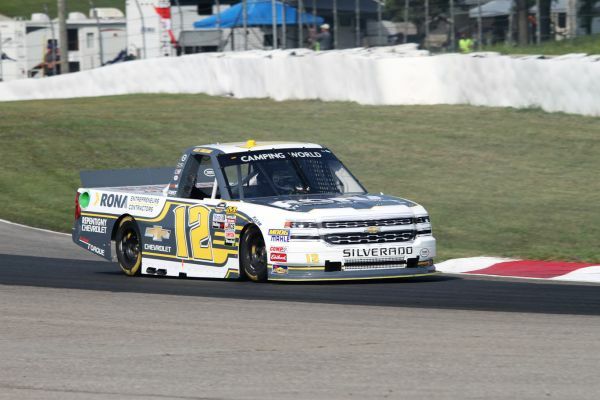 Pulling double duty on Sunday at CTMP, Tagliani followed his NASCAR Pinty's race to run in Round 17 of the NASCAR Camping World Truck Series. Starting 10th, the Canadian Motorsports Hall of Fame inductee used a different pit stop strategy that served him well throughout the first two segments of the race, running in eighth place when the third and final segment began. 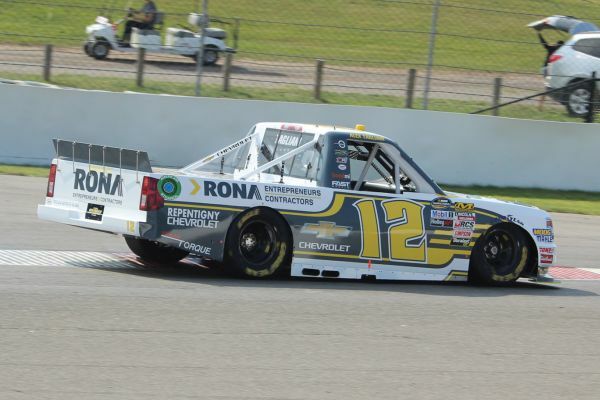 Seventh with 11 laps to go in the 64-lap race, his #12 Young's Motorsport RONA "Contractors Division" sponsored Chevrolet Silverado was pushed into a 360 degree turn by an eager competitor and sent him down the field to 20th position. With nothing to lose, he moved up the field to 10th place with 13 laps to go in the Chevrolet Silverado 250 that went into NASCAR overtime, to score another top-10 finish in this series. "After being pushed around on the track, I would say that this was a well-earned 10th place finish for Young's Motorsports team," continued Tagliani. "I think there is too much pushing and shoving in the truck series. The guy who pushed me out did not want to work to earn my position, he just shoved his way past me. Our Pinty's series has much cleaner races than the truck series. It should be up to that series to clean up their sport. Overall, I am happy with the finish." The Chevrolet Silverado 250 was won by Justin Haley ahead of Joe Nemecheck and Brett Moffitt. The NASCAR Pinty's Series will have a week off after a month-long, four consecutive race schedule. The drivers will head to the province of Quebec for the third and final time this season on Saturday, September 8 for the Lucas Oil 250 at Autodrome Saint-Eustache which is located northwest of Montreal.